Liver disease secondary to chronic hepatitis C virus (HCV) infection is an important cause of morbidity and mortality in dialysis patients and kidney transplant recipients. Evaluation of patients with chronic HCV infection is warranted to determine stage of disease and the need for HCV therapy. Although combination therapy with interferon (IFN) plus ribavirin is the standard of care for chronic HCV infection, IFN monotherapy is recommended in dialysis patients because ribavirin is contraindicated in the presence of renal failure. The goals of pretransplantation HCV therapy are to decrease the risk for progression of HCV-associated liver disease, stabilize renal function in patients with HCV-related glomerulopathy, and prevent development of HCV-associated renal disease after transplantation. Posttransplantation HCV therapy is generally not recommended because of concerns regarding risk for precipitating acute rejection; however, antiviral therapy may be indicated to treat HCV-related glomerulopathy or prevent progression of chronic hepatitis C in patients with more advanced stages of fibrosis. When treatment is required, restored renal function allows use of combination therapy with IFN and ribavirin. Limitations of current HCV therapy include lack of tolerability and suboptimal response rates. New antiviral agents that can be used in dialysis patients (e.g., ribavirin alternatives) and in the posttransplantation setting (e.g., IFN alternatives) are needed to improve outcomes in these populations. Hepatitis C virus (HCV) infection is an important consideration in kidney transplantation candidates and graft recipients. Mortality rates are higher among HCV-infected dialysis patients than among HCV-negative patients (1–3). Similarly, kidney transplant recipients who are positive for HCV antibodies (anti-HCV) have higher rates of liver complications and lower survival rates after transplantation than anti-HCV–negative recipients (4–6). Prevalence studies in developed countries indicate that between 3.4 and 32.1% of patients who are on maintenance hemodialysis are anti-HCV–positive (1,7,8). In the past decade, center-specific studies have reported a decline in the frequency of HCV infection in patients who are on maintenance hemodialysis (1), which may be attributable to a decline in the prevalence of HCV infection in patients who start dialysis, a higher mortality rate among these patients (2,4,5), or a reduction in the incidence of newly acquired HCV infection (9). A US Renal Data System survey of data from 36,956 patients from 1996 to 2001 showed a 6.8% prevalence of HCV infection determined by antibody screening of adult recipients of grafts from deceased donors (10). On the basis of United Network for Organ Sharing data from January 2004, anti-HCV is present in 5.2% of patients who receive renal transplantsa ; the total number of kidney transplantations in the United States in 2004 was 16,004 (11). HCV infection is an independent predictor of death in dialysis patients, increasing the risk for death 1.62- to 2.39-fold (2,4,5). Cirrhosis and other liver-related deaths are reported more frequently in HCV-infected dialysis patients than in those without the virus (3,4). Although not yet proven, treatment of HCV in dialysis patients may be an important means of reducing the risk for liver-related complications in patients who are on dialysis and after renal transplantation. National databases are limited in their ability to determine accurately the prevalence of HCV infection among dialysis patients because HCV testing is not uniformly performed on patients who start dialysis, and HCV RNA testing to confirm infection in anti-HCV–positive individuals is used inconsistently. In addition, the prevalence of HCV infection may be underestimated on the basis of an antibody assay alone. This was a more problematic issue with earlier versions of the assay, which were less sensitive to the reduced antibody response to HCV antigens that are present in dialysis patients (12). The rate of false-negative test results is substantially lower with a third-generation immunoassay (enzyme immunoassay-3) than with earlier assays (13–15). However, for patients with suspected HCV infection but a negative antibody test result, such as those with elevated serum aminotransferase levels, an HCV RNA assay with a detection limit ≤50 IU/ml is recommended to evaluate for infection (16). In dialysis patients with chronic HCV infection, serum aminotransferase levels are not reliable in determining disease activity and fibrosis severity (17,18). Uremic patients with HCV are more likely than nonuremic patients to have persistently normal serum aminotransferase levels (1), and uremic patients who have normal aminotransferase levels and are undergoing long-term dialysis seem to have higher degrees of hepatic fibrosis than those without uremia (19). Therefore, the presence of persistently normal serum aminotransferase levels does not exclude the presence of significant liver disease. Single-center studies that evaluated histologic severity of liver disease among patients who had hepatitis C and were awaiting kidney transplantation found that up to 22% have advanced hepatic fibrosis (20,21). Martin et al. (20) evaluated the histologic features of chronic HCV infection in 37 anti-HCV–positive patients who had chronic kidney failure and had been referred for transplantation. Of the 28 patients who were hemodialysis dependent, 28 (100%) had mild or moderate necroinflammatory activity, 22 (79%) had fibrosis, and three (11%) had cirrhosis. No relationship was found among liver histology, HCV RNA level, and aminotransferase activity. Sterling et al. (21) reported advanced fibrosis (bridging fibrosis or cirrhosis) in 11 (22%) of 50 consecutive HCV-positive kidney transplantation candidates. The true prevalence of advanced fibrosis among HCV-infected dialysis patients is unknown, because the published histologic studies focused on selected patients who were being evaluated for kidney transplantation. Liver biopsy remains the gold standard for assessment of disease severity. Fibrosis indices that were assessed using routine blood tests (22,23) or specialized panels of serum markers (24–26) have been reported. To date, only the FibroTest (BioPredictive, Paris, France) has been studied in dialysis patients and renal transplant recipients (27) and was found to predict fibrosis less well than in a general population of HCV-infected individuals. However, FibroTest showed a positive predictive value for advanced fibrosis (bridging fibrosis and cirrhosis) of 71% (compared with liver biopsy) and a negative predictive value of 77% (27). Evaluation of noninvasive measures of fibrosis would be particularly relevant in the dialysis population, given the potentially greater risk for bleeding that is associated with liver biopsy. The algorithm that is used at our center for evaluation of anti-HCV–positive patients who are under consideration for kidney transplantation is presented in Figure 1 (9,28). 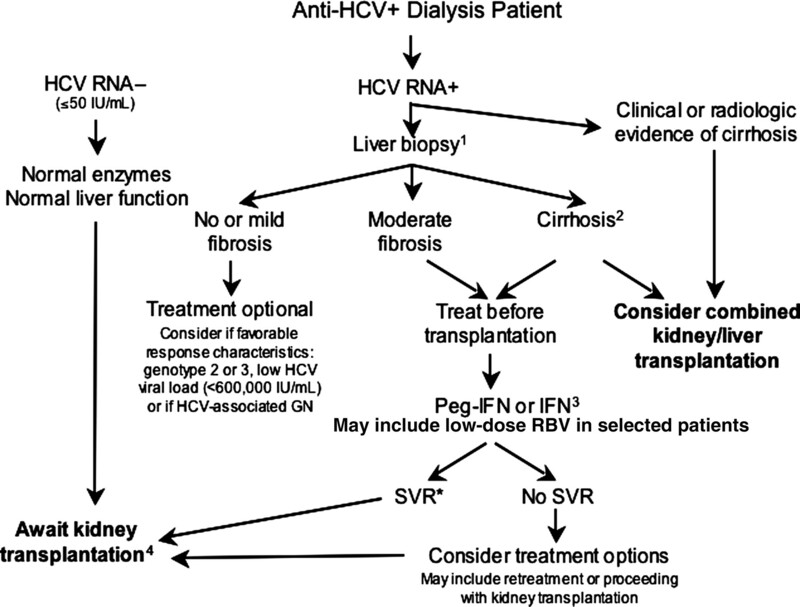 Suggested algorithm for evaluation and treatment of anti–hepatitis C virus (anti-HCV)-positive patients who are under consideration for kidney transplantation. 1For patients with HCV-associated glomerulonephritis, strong consideration of HCV treatment is recommended before transplantation to prevent recurrent glomerulonephritis after transplantation. 2Practices vary by center regarding whether patients with cirrhosis are referred for combined liver-kidney transplantation or considered for kidney transplantation alone. 3The usual treatment duration is 12 mo. Patients who fail to achieve an undetectable HCV RNA level (<50 IU/ml) after 6 mo of treatment are highly unlikely to achieve SVR with continued treatment and should have treatment discontinued. 4Patients who wait several years on the transplant waiting list may require retesting of HCV RNA before transplantation to confirm presence/absence of infection. In addition, repeat liver biopsy may be considered if the interval from the previous biopsy is >3 yr. The ideal interval for follow-up biopsy is not known. For immunocompetent patients, the recommended interval is every 3 to 5 yr (National Institutes of Health HCV Consensus Statement, 2003), and populations with potentially accelerated progression warrant closer monitoring. GN, glomerulonephritis; IFN, interferon; RBV, ribavirin; SVR, sustained virologic response. Cohort studies have found an association between HCV infection and graft and patient survival (Table 1) (6,29–33). Mathurin et al. (6) reported a 10-yr survival rate of 65% among patients with antibodies to HCV and 80% among those without serologic evidence of previous hepatitis B or C (P < 0.001), with age at transplantation (P < 0.001) and anti-HCV status (P = 0.005) as independent prognostic factors. Espinosa et al. (4) reported that the 8-yr patient survival in 57 HCV-positive patients was 20% lower than in 118 anti-HCV–negative control subjects (32 versus 52%; P = 0.03). At a median of 10 yr after transplantation, 17.5% of the HCV-positive patients had cirrhosis (4). These findings suggest that cirrhosis and other liver-related complications may reduce survival in HCV-positive transplant recipients. In contrast, two earlier studies reported no difference in long-term survival between HCV-positive and HCV-negative kidney transplant recipients (33,34). Potential explanations for the different study results include differences in the stage of liver disease at the time of transplantation, the prevalence of associated comorbidities such as diabetes and cardiovascular disease in the transplant recipients, and differences in immunosuppressive regimens. HCV viral loads increase approximately 1.0 to 1.5 log10 IU/ml after transplantation, and alanine aminotransferase (ALT) levels increase in transplant recipients with previously normal liver tests and rise even higher in those with preexisting ALT elevations (31,34,35). However, ALT levels cannot be relied on to identify accurately those with significant histologic disease (9). Paired biopsy studies that evaluated the rate of fibrosis progression showed increased fibrosis in 36% of patients during the 3-yr follow-up (36). The prevalence of cirrhosis has been reported to be 5 to 21% after 3 to 7 yr of follow-up (37,38). It is interesting that in one study that performed sequential biopsies every 3 to 4 yr in 51 renal transplant recipients, approximately 40% of the biopsy samples showed progression of fibrosis, approximately 40% showed stable levels of fibrosis, and 20% showed regression of fibrosis (39). The risk factors that were most consistently associated with progression of fibrosis were severity of liver disease before transplantation and duration of follow-up after transplantation (39,40). There was no evidence that progression of fibrosis in these patients was related to HCV RNA load or genotype (36). The effect of specific immunosuppressive drugs on HCV disease progression has not been studied. Chronic HCV infection has been associated with the development of mixed essential cryoglobulinemia (41). Types II and III cryoglobulinemias are systemic vasculitides, and nearly half of the HCV-infected patients who have type II or III cryoglobulinemia develop renal complications, including membranoproliferative glomerulonephritis and membranous nephropathy (42). Therefore, in addition to its direct effects on the liver, HCV infection increases posttransplantation morbidity by enhancing the risk for de novo or recurrent HCV-associated glomerulopathies (43–47). Recurrence of HCV-associated kidney disease has the potential to adversely affect graft survival and has been linked to higher serum creatinine levels (44,48). In patients with HCV-associated renal disease, sustained virologic responses (SVR) to antiviral therapy have been associated with improvements in renal histology (reduced glomerular inflammation and immune deposits) and in biochemical markers of renal function (49). However, the clinical and histologic improvements are not seen uniformly. An improvement in histology may be seen in the absence of a virologic response, and a lack of improved histology despite a virologic response also has been described. The latter may be related to the severity (and therefore the reversibility) of the renal disease at the time of treatment initiation (50). New-onset diabetes develops within 36 mo of kidney transplantation in up to 24% of patients (51,52). A recent meta-analysis of 10 studies in 2502 renal transplant recipients showed a strong link between anti-HCV seropositivity and posttransplantation diabetes (53). The adjusted odds ratio for diabetes was 3.97 (95% confidence interval 1.83 to 8.61; P < 0.047). Other factors that contributed to the risk for diabetes included treatment with corticosteroids or calcineurin inhibitors, especially tacrolimus (54–58). HCV infection is associated with increased insulin resistance (59), although the underlying mechanisms are unclear. Cytokine profiles that reflect chronic inflammation and high HCV viral loads have been associated with insulin resistance (59–61), leading to the question of whether HCV eradication can prevent or reduce the risk for development of posttransplantation diabetes. Remarkable strides have been made in treating chronic hepatitis C in the past 15 yr. Currently, immunocompetent patients who have chronic HCV and are treated with pegylated IFN and ribavirin achieve SVR rates of approximately 55% overall (62,63). SVR, defined by an undetectable HCV RNA (<50 IU/ml) in serum at least 6 mo after stopping treatment, is the primary goal of antiviral treatment and is associated with normalization of ALT levels and improved histology in the majority of treated patients (62,63). Attainment of SVR in dialysis patients would be expected to minimize the risk for long-term complications, both before and after kidney transplantation. Success in treating HCV-related glomerulopathies with antiviral therapy has been reported in nontransplantation patients (49,64). Viral eradication in patients with HCV-associated glomerulopathy may stabilize renal function and prevent recurrent glomerulonephritis in the allograft after renal transplantation (28). A pharmacokinetic analysis showed that clearance of IFN-α in patients who undergo dialysis is approximately half of that of patients with normal renal function (65). Studies of dialysis patients who were successfully treated before transplantation indicated that HCV eradication is maintained after transplantation, with undetectable HCV RNA in serum (66–68). This supports the practice of treating dialysis patients before transplantation for the prevention of posttransplantation complications. The impetus to treat dialysis patients who are infected with HCV and awaiting kidney transplantation is further supported by concerns that IFN is associated with an increased risk for renal allograft rejection when used after renal transplantation (69,70). IFN has immunomodulatory properties, including increased expression of cytokine genes and surface expression of human leukocyte antigens, which may result in production of donor-specific alloantibodies and increase the likelihood of humorally mediated rejection (71). Early case reports of use of nonpegylated IFN in kidney transplant recipients showed deterioration in renal function in approximately 40% of cases (69,72). However, these reports are largely from uncontrolled studies, and the findings were likely influenced by the type of maintenance immunosuppression regimen used, timing of treatment in relation to transplantation, and the interpretation of histologic changes in the kidney in the presence of IFN. Regardless, in the absence of controlled studies, most experts recommend against the use of IFN after kidney transplantation (73,74). Other potential limitations of IFN in kidney transplant recipients include a reduced response to antiviral therapy in the presence of immunosuppression and limited tolerability of current HCV agents (IFN and ribavirin), as shown in liver transplant recipients with HCV (75,76). Pegylated and nonpegylated (i.e., standard, short-acting) IFN and combination therapy with nonpegylated IFN plus low-dosage ribavirin have been evaluated in patients with ESRD (77,78). The majority of the published studies used IFN monotherapy for treatment periods of 24 to 48 wk (Table 2) (77,78). Data on the efficacy of pegylated IFN monotherapy are more limited in patients with ESRD (79–81), and whether pegylated IFN is superior to nonpegylated IFN in this population is unclear. A great need exists for large-scale studies that define the optimal therapy for dialysis patients with chronic HCV infection. Studies in black dialysis patients are of particular importance, because rates of response to IFN-based therapy in nondialysis patients are significantly lower in black patients (19 to 28%) than in white patients (39 to 52%) (82–84). Monotherapy with nonpegylated IFN 3 to 5 MU thrice weekly for 24 to 48 wk has shown modest efficacy in treating HCV infection in patients who have ESRD and are undergoing dialysis. Two meta-analyses of data from 482 patients in 25 published studies indicated that those who received IFN monotherapy had SVR rates of 33 to 39% (77,78). Subanalyses found SVR rates of 26 to 30.6% in patients with genotype 1 infection (77,78). These SVR rates are higher than those that traditionally are reported in nondialysis patients who receive nonpegylated IFN monotherapy (6 to 19%) (85,86) and may be related to an increased IFN exposure in dialysis patients as a result of the lower clearance of IFN-α (65). Predictors of response have not been identified. SVR rates for patients with HCV genotype 1 are predicted to be lower than in patients with HCV non-1 genotype, but the number of patients who had non-1 HCV genotypes and were included in the published studies was too small to draw firm conclusions (77,78). Discontinuation of therapy as a result of adverse events, most often neuropsychiatric (e.g., headache, depression), gastrointestinal (e.g., nausea, anorexia), or flu-like symptoms, were reported in 30, 20, and 17% of patients, respectively (77). Pegylated interferons (peg-IFN α2a, peg-IFN α26) are covalent conjugates of recombinant IFN with polyethylene glycol (87,88). The manufacturer's package inserts for both forms of pegylated IFN caution against use in patients with creatinine clearances of <50 ml/min (87,88). Hemodialysis clears each drug at a different rate (87,88). The recommended dosage of pegylated IFN-α2a for patients with creatinine clearances of <20 ml/min is 135 μg/wk (89). No specific dosing recommendations in patients who are on dialysis are published for pegylated IFN-α2b. A preliminary report of 27 HCV-infected hemodialysis patients who were treated with nonpegylated IFN 3 MU thrice weekly (n = 20) or pegylated IFN-α2a 135 μg/wk (n = 7) reported end-of-treatment virologic responses in 50 and 43%, respectively (90). A case study in a hemodialysis patient found that thrice-weekly administration of nonpegylated IFN-α2b was more efficacious and associated with a shorter duration of treatment-related adverse effects than once-weekly administration of pegylated IFN (91). Large-scale comparisons of pegylated versus nonpegylated IFN therapy have not been conducted to determine which drug best balances efficacy and tolerability. Ribavirin is cleared renally and contraindicated in patients with low creatinine clearances and in those who are undergoing dialysis (92). There is a black-box warning regarding the dosage-related risks of hemolytic anemia in patients who have renal dysfunction and are treated with ribavirin. In addition, anemia, common in patients with ESRD, can be exacerbated by ribavirin. However, because combination therapy with IFN and ribavirin substantially increased treatment efficacy in nondialysis patients (85,86), there is great interest in the use of low-dosage ribavirin together with IFN in dialysis patients. In a pilot study of five HCV-infected hemodialysis patients, ribavirin (200 mg/d increasing up to 600 mg/d in 6-wk increments) and nonpegylated IFN (3 MU thrice weekly) were given for up to 40 wk (93). All five patients received recombinant human erythropoietin (rHuEPO) before and during the study, and blood transfusions were permitted if needed. Combination therapy markedly reduced HCV RNA levels in all five patients, becoming undetectable in four. However, ribavirin-related anemia was associated with a need for higher dosages of rHuEPO and blood transfusions in all patients, and ribavirin had to be discontinued in two. The achievable dosages of ribavirin ranged from 200 mg daily to thrice weekly (93). Bruchfeld et al. (94) reported on patients who experienced ribavirin-related anemia but were able to maintain ribavirin dosing in the 170- to 300-mg/d range with high dosages of rHuEPO (20,000 to 30,000 IU/wk) plus supplemental iron; no transfusions were necessary. More recently, Mousa et al. (95) demonstrated that hemodialysis patients (n = 11) with chronic hepatitis C could be treated safely with nonpegylated IFN-α3 MU thrice weekly plus ribavirin 200 mg thrice weekly. The SVR rates after treatment for periods of 24 and 48 wk were 66 and 55%, respectively, and rHuEPO dosages were not significantly changed throughout the study. Further studies are needed to define the safety and gain in efficacy with use of low-dosage ribavirin therapy. The limited studies to date indicate that the complications of anemia may be managed with more aggressive use of rHuEPO and blood transfusions. Studies in HCV-infected patients who had normal renal function and were treated with IFN and ribavirin have shown that rHuEPO can help maintain ribavirin dosages, correct anemia, and improve quality of life during treatment (96,97). However, rHuEPO adds to the total costs of treatment, and both rHuEPO and blood transfusions carry some risk for complications (98). In summary, the standard of care for treatment of HCV in dialysis patients remains IFN monotherapy. Whether pegylated IFN offers advantages over nonpegylated IFN is unknown. The treatment duration with IFN monotherapy is typically 48 wk (86). However, evaluation of response at 3 or 6 mo will identify nonresponders. In nondialysis patients, failure to achieve an HCV RNA of ≤50 IU/ml after 6 mo of treatment is highly predictive of nonresponse. Therefore, patients who fail to achieve this early response generally should have treatment discontinued. Treatment of HCV in kidney transplant recipients is not routinely recommended (35,69,70,99–101) because of concerns about IFN precipitating acute rejection. However, there are clinical circumstances in which a risk–benefit assessment may favor treatment, and some data suggest that certain transplant recipients will benefit from treatment with IFN monotherapy or IFN plus ribavirin combination therapy (Table 3) (71,72,102–105). For example, HCV-associated glomerulonephritides can recur after kidney transplantation and cause progressive renal dysfunction, and antiviral therapy may be needed to prevent graft loss (106,107). In addition, patients with advanced fibrosis (bridging fibrosis or cirrhosis) or severe cholestatic hepatitis warrant consideration of treatment to prevent death as a result of liver-related complications. Therefore, the decision to treat a kidney transplant recipient with IFN-based antiviral therapy must be individualized. Acute rejection has been reported in several published studies in HCV-infected kidney transplant recipients, with rates varying from 15 to 64% (35,100,101,104,108–110). In a cohort of 16 stable kidney transplant recipients who were treated with IFN-α2b for chronic HCV disease, an acute rise in serum creatinine was noted in 37% of patients and necessitated biopsy (111). The most prominent histologic findings were diffuse interstitial edema associated with dilation of the peritubular capillaries; inflammatory infiltrates and glomerular involvement were seen infrequently. No differences were observed between patients who experienced graft rejection and those who did not with respect to baseline immunosuppression, HLA matching, total peripheral blood lymphocyte count, or peripheral blood lymphocyte subtypes. On the basis of these results, the authors recommended against use of IFN in kidney transplant recipients until the mechanism of IFN-associated graft rejection was better understood (111). Baid et al. (71) reported their experience with acute humoral rejection in IFN-treated renal allograft recipients with chronic hepatitis C. Within 6 mo of the start of HCV therapy, two (17%) of 12 treated patients developed acute humoral rejection, with anti-HLA donor-specific antibodies (DSA) in the sera and stainable C4d in the peritubular capillaries of the rejecting organs. Because no other patient developed anti-HLA DSA, the investigators proposed that the basis for rejection was IFN-induced DSA production (71). These studies underscore the complexity of the association between acute rejection and IFN exposure and point toward a continued caution in using IFN-based therapy in kidney transplant recipients. Several factors have been proposed to minimize the risk for acute rejection during antiviral therapy. Treatment in the first year after transplantation may increase the risk for acute rejection, which is already highest during this time (71). Antiviral therapy may be safer if given years after transplantation and in patients with stable graft function and no history of rejection (104,112). In addition, patients should be on a stable immunosuppressive regimen and have therapeutic drug levels of immunosuppressive drugs at the time of IFN treatment. Finally, the use of ribavirin, a drug with immunomodulatory potential, may positively modulate the risk for acute rejection (113). No randomized, controlled studies have compared IFN and IFN plus ribavirin, but the superior efficacy of the combination therapy in nontransplantation patients supports its preferred use in kidney transplant recipients with acceptable renal function. Studies in patients with chronic hepatitis C and normal renal function found that ribavirin monotherapy conferred no antiviral or histologic benefit (114–116). Similarly, small studies that assessed ribavirin monotherapy in kidney transplant recipients reported improved serum aminotransferase levels, but no significant reduction in the rate of fibrosis progression, and persistence of HCV infection in all patients (113,117,118). Therefore, there is no role for ribavirin monotherapy in the management of HCV disease in kidney transplant recipients. As previously highlighted, the combination of IFN plus ribavirin is superior to IFN monotherapy in patients with chronic hepatitis C (85,86). Because ribavirin is cleared by the kidneys and therefore accumulates in patients with impaired renal function, the use of ribavirin in combination with IFN will be governed by the functional status of the renal allograft. In kidney transplantation patients, tolerance to ribavirin varies (93,94); the associated hemolytic anemia may require large dosages of rHuEPO or ribavirin dosage modification. The variable tolerability of ribavirin may be secondary to several factors, including the effects of immunosuppressive drugs on kidney function and differences in ribavirin clearance. The optimal antiviral approach in transplant patients who warrant treatment of HCV is unclear. Shu et al. (102) studied a modified combination regimen that was designed to improve the tolerability of the regimen and counter the risk for IFN-associated rejection. They treated 11 patients with ultra low–dosage IFN-α (1 MU thrice weekly) plus ribavirin (600 mg/d) for 48 wk. At the end of treatment, five patients were HCV RNA negative, three had sustained biochemical and virologic responses, and three discontinued treatment because of acute graft rejection (n = 1) or urosepsis (n = 2). The investigators considered the intervention relatively safe for the population (102). However, further studies are needed before this or other IFN-containing regimens can be routinely recommended in kidney transplant recipients with chronic hepatitis C.
Recurrent and de novo HCV-associated renal disease occurs in kidney transplant recipients. The most common manifestation is membranoproliferative glomerulonephritis, often in association with cryoglobulinemia (119,120). Other glomerular diseases may occur, including membranous glomerulonephritis, FSGS, minimal-change disease, and rarely thrombotic microangiopathy (121–123). Patients typically present with a rising creatinine, proteinuria, and occasionally hematuria. Management of HCV-associated glomerulopathy is guided mostly by anecdotal experience, with no clear practice guidelines available. In general, treatment depends on the specific histologic lesion and the severity of clinical symptoms. Antiviral therapy has been best studied in nontransplant patients with HCV-associated membranoproliferative glomerulonephritis and cryoglobulinemia (50). For patients with mild to moderate disease, antiviral therapy with IFN-α (pegylated and nonpegylated forms) and ribavirin is generally considered first-line therapy (49,64,124). Treated patients typically demonstrate improvements in renal function and reduced levels of cryoglobulins. Although early reports indicated a high rate of relapse after IFN discontinuation, relapse rates seem to have declined after ribavirin was used in combination with IFN (49,64,124). Pretransplantation therapy for HCV and achievement of viral eradication reduces the likelihood of recurrent or de novo glomerulonephritis after transplantation. In a study of 15 HCV-positive patients who were awaiting kidney transplantation and were treated with IFN, 10 (67%) became HCV RNA negative at the time of transplantation, and none of these patients developed glomerulonephritis after transplantation (28). The one patient (7%) who developed de novo glomerulonephritis had detectable HCV RNA levels at the time of transplantation. In contrast, among 63 untreated renal transplant recipients, 71% of whom were HCV positive, 12 (19%) developed de novo glomerulonephritis, and all 12 were HCV positive at the time of transplantation (P < 0.0001). This indicates that up to 27% of HCV RNA–positive patients developed de novo glomerulonephritis and that eradication of HCV pretransplantation prevented this complication. In patients with a rising creatinine as a result of HCV-related glomerular disease, the risk–benefit ratio usually favors initiating therapy with IFN and ribavirin, because allograft survival is at risk. Also, the risk for recurrent glomerular disease after transplantation provides additional impetus to consider treatment of HCV-infected patients who are on the transplant waiting list. Kidney transplant recipients who are positive for the HCV antibody have a reduced survival (29). Approximately 40% of transplant recipients will have progressive liver fibrosis within the first 5 yr, and those with advanced fibrosis are at risk for liver-related complications (35). HCV-infected patients who have ESRD and are treated with HCV therapies and achieve an SVR before transplantation usually maintain this response after transplantation (77,78). Eradication of HCV infection before transplantation seems to reduce the risk for HCV-associated renal dysfunction after transplantation and may reduce the risk for HCV disease progression, thereby providing the rationale for treatment of HCV before transplantation. The optimal treatment of HCV in dialysis patients has not been determined. IFN monotherapy is regarded as the treatment of choice, but it is not known whether pegylated IFN offer advantages over nonpegylated IFN. Dialysis patients have not been considered candidates for combination therapy using IFN and ribavirin owing to concerns regarding anemia that is induced by ribavirin (92). Further studies are needed to evaluate whether combining low-dosage ribavirin with IFN in patients who are undergoing dialysis leads to a higher SVR rate and whether the higher rate of anemia that is related to ribavirin use can be safely managed with high dosages of erythropoietin (92,125). Although treatment of kidney transplant recipients who have hepatitis C is not routinely recommended because of the potential risk for precipitating rejection, some clinical presentations warrant consideration of IFN-based therapy. The most pressing reasons to consider HCV therapy are recurrent and progressive HCV-associated glomerulopathy in the transplanted kidney, severe cholestatic hepatitis, and advanced histologic stages of liver disease (35). HCV-mediated glomerulonephritis may be effectively managed with IFN-based therapy. The current “best therapy” for these situations is combination therapy with IFN and ribavirin, because combination therapy is the most likely to achieve an SVR. However, ribavirin dosages must be adjusted on the basis of renal function to minimize the complications of anemia. The safety and the efficacy of pegylated IFN compared with short-acting nonpegylated IFN has not been assessed in this population. The long-acting pegylated IFN may theoretically have a higher risk for inducing acute rejection. In transplant recipients in whom anti-HCV therapy is undertaken, close monitoring for acute rejection, including acute humoral rejection, is essential. Given the paucity of data on treatment of dialysis and renal transplant recipients, there is a great need for large-scale, multicenter, clinical trials to determine the optimal approach to HCV infection in these populations. For dialysis patients, ribavirin is generally contraindicated, and alternatives are needed to enhance antiviral effects of IFN. New therapies such as taribavirin, a liver-targeted formulation of ribavirin, may have a lower incidence of treatment-related adverse effects than currently available drugs (126) and may offer specific advantages in this patient group. For renal transplant recipients, ribavirin can be used in combination with IFN in those with restored renal function, but the risk for acute rejection with IFN remains a concern. Therefore, there is a need for alternative therapies with greater safety and efficacy than IFN and ribavirin. N.A.T. has received grants or research support from Roche Pharmaceuticals, Human Genome Sciences, and Vertex Pharmaceuticals. N.A.T. is a consultant for Indenix Pharmaceuticals and is a member of the Speakers’ Bureau for Schering Plough. This work was supported in part by Health Resources and Services Administration contract 231-00-0115.
a United Network for Organ Sharing data were obtained by request 091405-10, submitted September 14, 2005, based on Organ Procurement and Transplantation Network data as of January 1, 2004. The content of this article is the responsibility of the authors alone and does not necessarily reflect the views or policies of the Department of Health and Human Services; neither does mention of trade names, commercial products, or organizations imply endorsement by the US government.